MANILA, Philippines – Mayors and governors should support the nationwide smoking ban by creating a smoke-free task force in their respective areas, according to the Department of the Interior and Local Government (DILG). Epimaco Densing III, DILG assistant secretary for plans and programs, said the task force would help in the implementation of the smoking ban. “We put a premium in prioritizing public health that is why full participation and commitment of local government units (LGUs) are required,” said Densing. He said the task force would coordinate with the Philippine National Police in implementing the EO, including the arrest of violators. On July 26, President Duterte signed Executive Order (EO) 26, which mandates the establishment of a smoke-free environment in public and enclosed areas. Densing called on the public to call hotline number 8888 for complaints on establishments and individuals not complying with the EO. 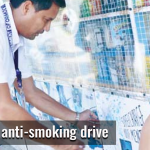 The DILG also urged LGUs to develop, promote and implement local smoking cessation programs in line with the program of the Department of Health. Smokers who are willing to quit or those found violating the EO may be referred to local smoking cessation programs and its facilities.